The ashrams of Truth Consciousness were founded by our Gurudeva, Prabhushri Swami Amar Jyoti, in the 1970s. We hope that you will find the following information of interest and of use. Please phone ahead for directions and to arrange your visiting time. “Ashram” loosely translates into English as “monastery.” In India, an ashram traditionally is the home of a Guru, Saint or Enlightened Master where seekers come from far and near to imbibe spiritual wisdom, training and upliftment. Even after the Master has left the body, his or her presence is palpably felt at the ashram, which becomes a place of pilgrimage, guidance, refuge and inspiration for countless souls. Follow a winding mountain road twelve miles west of Boulder, Colorado, to Sacred Mountain Ashram, situated among pines and aspens at 9000 feet elevation just east of the Continental Divide. Over 100 acres of forest, meadows and spectacular views beckon the seeker into the splendors of nature. The purity and silence of the surroundings, added to the powerful spiritual vibrations of this ashram, provide a fount of inspiration and regeneration for all who are blessed to visit or stay there. In the true sense of an oasis, Desert Ashram is a haven for animals, birds and people alike. Abundant plantings mingle with native plants of the Sonoran Desert with a view of the nearby Tucson Mountains. Winding paths and solitary benches offer space for quiet inner contemplation, while a vibration of sweet peace, refuge and sanctity makes this ashram a little bit of Heaven. You are always welcome to attend daily and weekly programs. If you would like a daytime tour or personal retreat, fill out the VISITOR FORM and let us know when you would like to come. Someone will be on hand to show you around and answer questions. You will see the ashram grounds, Jyoti Mandir (Temple of Light), the library and the area where our publications are on sale. Jyoti Dham, the residence of our Guru, may be viewed from outside. Please wear comfortable, modest clothing and shoes suitable for walking outdoors. When entering a building, shoes are left outside. Each morning begins with GURU AARATI, the chanting of Sanskrit mantras, offerings of incense and flowers and waving of a ghee lamp followed by group meditation. 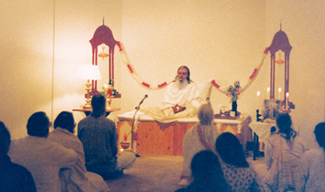 SATSANG is a focus of our life at the ashrams. Held each Sunday and Thursday night, Satsang is preceded by Aarati and devotional music. Satsang continues with a recorded spiritual discourse by our Gurudeva, Swami Amar Jyoti, and ends with meditation. People leave quietly when they are ready. Satsang communicates directly to the soul to answer our deepest questions, to awaken and inspire us to grow spiritually. In addition to individual MEDITATION, groups gather daily to meditate in the holy atmosphere of Jyoti Mandir. Meditation instruction by Prabhushri Swamiji is available on audio recordings. You may contact the ashram to ask about receiving this instruction. SPECIAL OBSERVANCES take place throughout the year on holy days and other occasions. Jyoti Dham, the residence of the Guru, may be visited at certain times throughout the year. A calendar of holy days is observed. These include the birthday of our Beloved Guru, Ganesha Chaturthi, Maha Shivaratri, Janmashtami, Christmas, Buddha Purnima, Durga Puja, Diwali and Ascension Day (Easter) among others. Video presentations such as the Ramayana or Mahabharata are presented occasionally. Almost all the work at the ashrams is conducted by ashramites and devotees as KARMA YOGA or selfless service. Among the numerous areas of service are cleaning, cooking, dishwashing, care of the gardens and grounds, office duties, publications production and distribution, construction, repair and maintenance, sewing and shopping. Karma yoga is one of the classical yoga paths to Moksha or liberation. The ashrams offer the opportunity for practice and growth in the karma yoga spirit. Residents are encouraged to do regular HATHA YOGA practice, and at certain times classes may be available. The asanas (postures) of hatha yoga are designed to promote physical strength and well-being and to support the relaxation and peace of mind so essential to the spiritual life. PUBLICATIONS of the ashrams are available for purchase. These include the marvelous books and recorded Satsangs of Swami Amar Jyoti; devotional music CDs; Light of Consciousness, Journal of Spiritual Awakening, the Prayer & Meditation Calendar, and others. Complete catalogs are yours for the asking. Our publications are available online at truthconsciousness.org. There is no CHARGE for any of the ashram programs or for meditation instruction but donations are customary and welcome. An exception is some hatha yoga classes, which may be taught by certified teachers and carry a small charge. DONATIONS in the form of tax-deductible contributions are the source of support for the ashrams and are needed and appreciated.